Oreo is doing it again! New flavors! 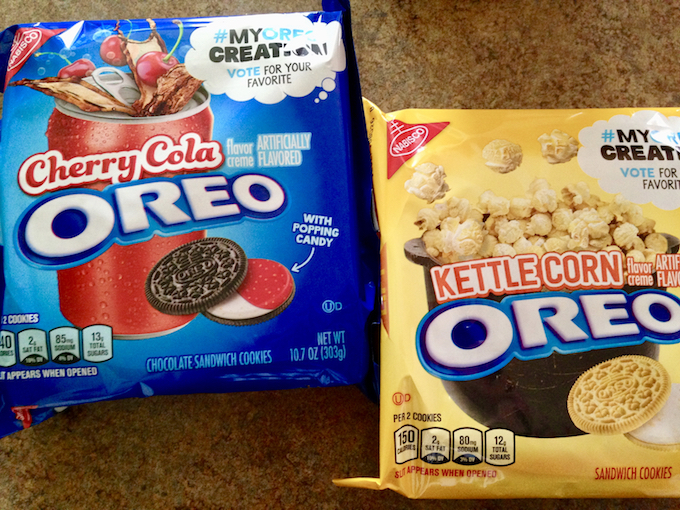 Oreo has released three new flavors; Cherry Cola, Kettle Corn and Piña Colada. Of course we wanted to try them since we have been trying to give all the new flavors a shot! Sadly our local Target was all sold out of the Piña Colada (which was the one that sounded best to me). Well, the Cherry Cola did taste like cola. It had popping candy in it which was fun, but there was a seriously strange flavor in it that wasn’t yummy. I didn’t like them at all. I think my husband liked them more than I did, as he ate more than one, but we both agreed we wouldn’t buy that flavor again. The Kettle Corn was pretty tasty, but kind of odd at the same time. It was sweet, and had that caramelized sugar flavor in it. It also had a buttery flavor to me, like popcorn would. It’s supposed to have little puffed pieces inside, but I couldn’t feel them. Worth eating more than one of them though. Hoping that we can find the Piña Colada at another store so we can give those a try too. I do wonder why they only made those in thin instead of regular size, but I have a feeling they might be the best of the three. Have you tried any of the new flavors? What did you think?